When you are unable to take landscape photos because of the weather or because you are unable to get out of the house, try your hand at creating Macro landscapes, with the help of this article from Picture Correct by David Bigwood, an Australian based writer and photographer. When I began making pictures of the landscape, it was always the big picture that figured and I suppose it’s the same for most of us. It was a case of a few exposures and then move on to the next grand view. Then came the day when I ‘needed’ to make some pictures – photographers will know what I mean – and the weather was against me. Uniformly grey cloud and lousy light are no recipe for great landscape shots. With the itch in my shutter finger unsatisfied, I had to find a subject so I began casting around the area and, what do you know, there were dozens of them. Of course there were for those who have eyes to see. The big picture is made up of thousands, maybe millions of smaller pictures and this is what I had been missing. This new series of Expanded Guides focuses on photographic techniques not only to give you a comprehensive grounding in the subject but also takes you a step further to enable you to get much more from your photography. Expert advice, with useful hints and tips, is given by professional photographers, using practical examples of techniques for clarity, illustrated in full colour with the aid of clear diagrams and charts. Macro Photography is an essential guide to a fascinating technique, beginning with an explanation of the difference between close-up and macro work. 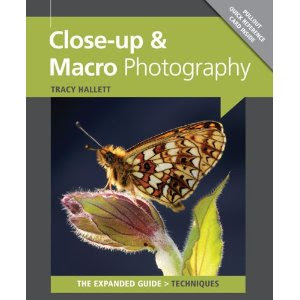 Aimed at both the novice and more experienced amateur, the book describes the equipment for capturing true macro images, the 'macro' mode on standard DSLRs, and the use of zoom lenses, wide-angle lenses, dedicated macro lenses, teleconverters, bellows and reversing rings. The theory of exposure and metering, light, colour and flash is explained, and there's practical advice on composition and focusing. Project ideas include success with flower photography, capturing the textures of materials such as bark and lichen, abstracts from everyday objects, photographing insects, and studio work with food and jewellery.